Degas – Hey that Looks Like My One! 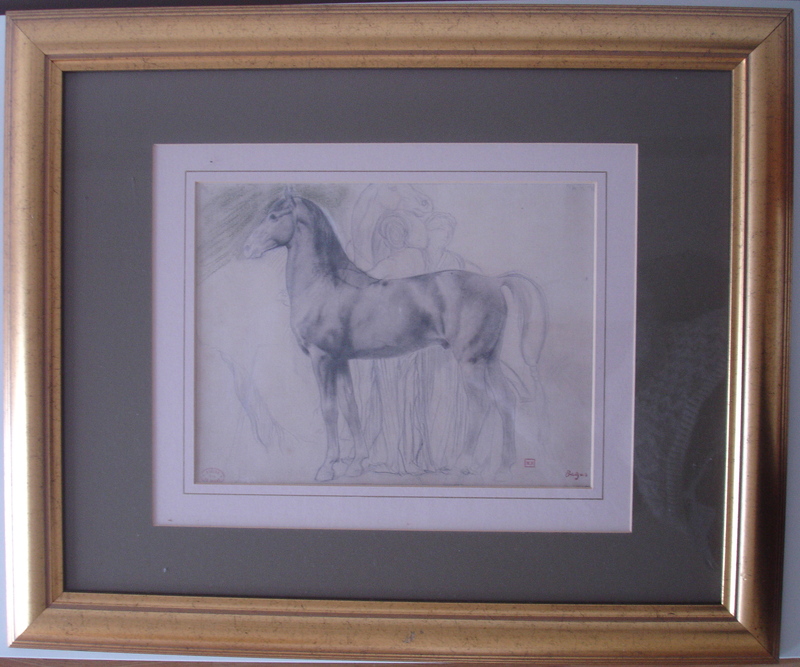 You know the guy who loved to paint ballerinas – Edgar Degas (1834 – 1917) – well one afternoon while I was in Southgate Auction House I chanced upon a Degas drawing of a horse. It was signed in red and stamped with the printer’s stamp. Could it be a sleeper? Nah, it’s just a print I thought to myself (as in a print of the original stamped print) and went for a cuppa in their little café. Still, I couldn’t help wondering (even though NOBOBY else was paying any attention to it) what if it is an original signed print? Maybe it’s a sleeper after all and I’m the only one in the room who sees it. But honestly, I know nothing really about Degas. Did he even draw horses? I checked on my phone. Yes, he did! The auction was well underway when I returned to the salesroom, in fact the Degas print was about to come up and acting impulsively (always a mistake) I bid on it and bought it for something silly like a £5er plus commission. 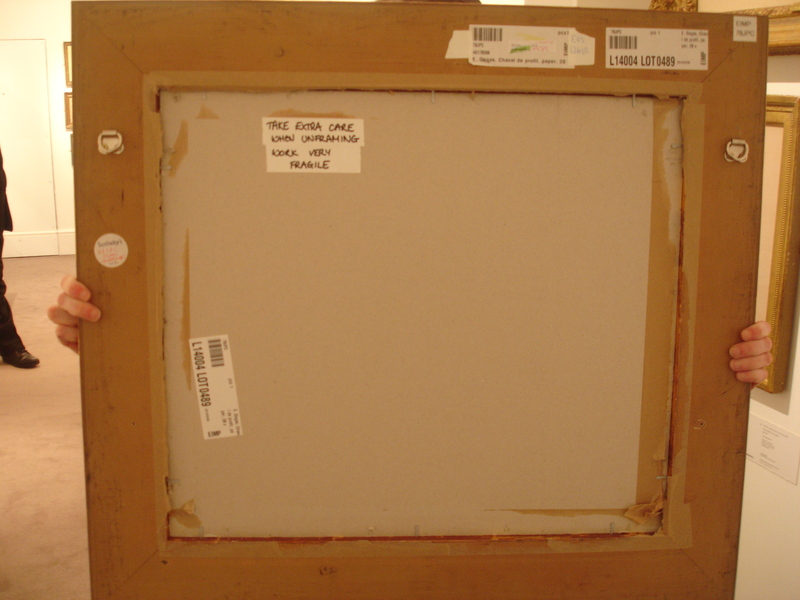 At home I carefully undid the back of the frame and had a proper look at it. It was a print of a print – bugger n arse – well what did I expect? 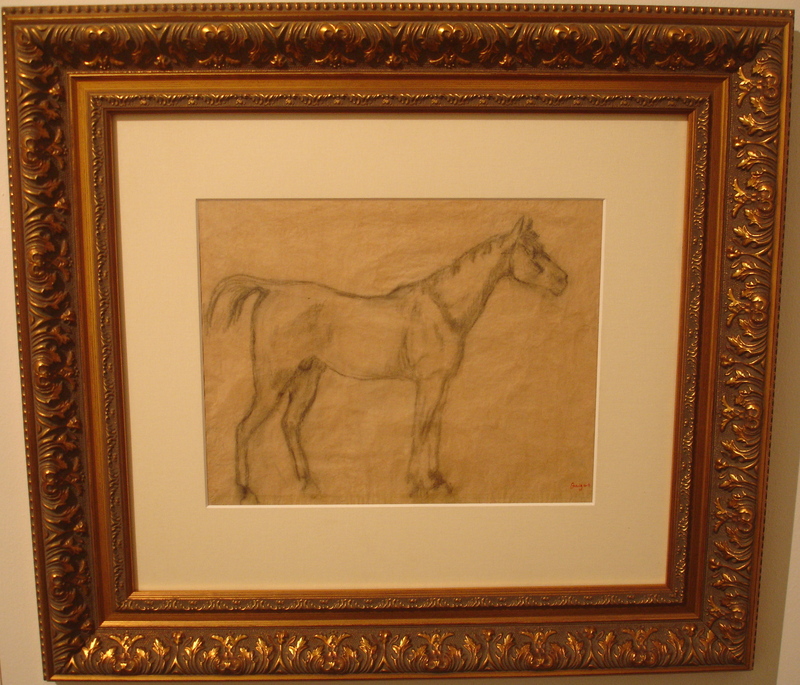 This afternoon as I wandered – as opposed to rummaged – around Sotheby’s upcoming Impressionist and Modern Art day sale, I saw this lovely drawing of a horse by Degas – lot number 489. It hit a familiar chord and I really enjoyed looking at it up close and even asked to see the back of the frame. (I love frames; I think they tell a lot about a painting). As it’s a drawing, it’s going to be a lot more expensive than a print or lithograph. This one’s estimated to sell between £10,000 – £15,000, a tad above my budget but at least now I know what the real thing looks like. Above, the picture on the left shows the Sotheby’s drawing, the one on the right is from my own private collection! Will report back on the final sale price of the real thing.